The Financial Stability and Development Council meeting on Tuesday started with an air of tension in the room. An official present described the participants’ body language as “tetchy”. However, once presentations and discussions begun, the mood considerably eased. Differences between the government and the Reserve Bank of India were again evident in a meeting of the Financial Stability and Development Council on Tuesday, when they disagreed on the liquidity situation in non-banking financial companies and the need for a separate payments regulator. The Infrastructure Leasing & Financial Services crisis and its impact on NBFCs took centre stage, with the government wanting the banking regulator to relax its liquidity squeeze but RBI Governor Urjit Patel held his ground in thwarting any spread of crisis, sources present in the meeting said. 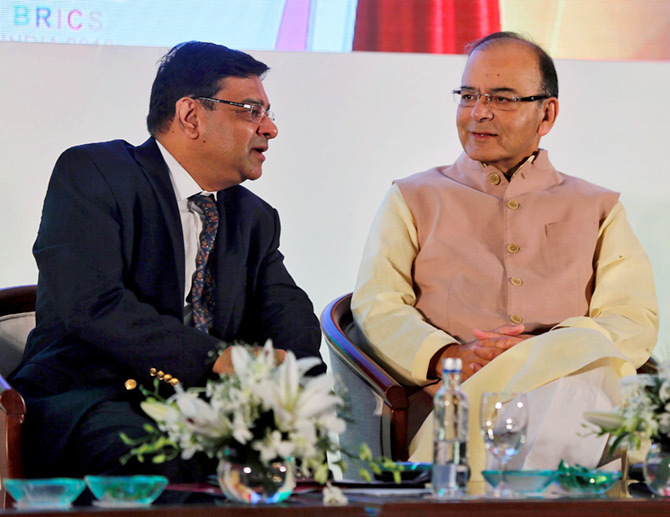 Finance Minister Arun Jaitley, who chaired the meeting, told the RBI to ensure adequate liquidity in NBFCs was maintained and there was no knock-on effect on other NBFCs and other sectors, sources said. “The government made it clear that an IL&FS-like situation should not arise. It asked the regulator to ensure that the contagion did not spread,” another official said. The RBI, however, said the cash crunch the NBFCs faced was not widespread and the data with the regulator showed that there were no systemic issues. “The RBI said that inflation was under control and there was no tightening of policy at its end,” the source quoted above said. In its monetary policy meeting earlier this month, the RBI had kept the repo rate -- the rate at which it lends to commercial banks -- unchanged at 6.5 per cent while shifting its stance to “calibrated tightening” from “neutral”. The department of financial services was asked to submit data on the liquidity situation in NBFCs to the RBI, sources said. The payments regulator issue was also discussed in the meeting and the RBI reiterated its stance that a separate regulator was not required. The Centre has proposed to set up an independent Payment Regulatory Board to oversee all payment systems in the country and the RBI had released a dissent note last week, saying the body must remain with the regulator. “On most points, the RBI was the lone warrior as all other regulators except Sebi (Securities and Exchange Board of India) toed the government’s line. Sebi remained mostly neutral,” the first person cited above said. The FSDC includes the heads of the financial sector regulators: Sebi, the Insurance Regulatory and Development Authority, the RBI, and the Pension Fund Regulatory and Development Authority, along with the chairman of the Insolvency and Bankruptcy Board. Unlike in the past, the RBI’s top leadership was present in full force with all the four deputy governors -- N S Vishwanathan, Viral V Acharya, B P Kanungo and M K Jain -- and Governor Urjit Patel attending the meeting, which went on for around two hours. The council also discussed the issues and challenges of cryptocurrency and the economic affairs department briefed about the possible legal framework to ban “private” cryptocurrencies. In the board meeting of the RBI held last Tuesday, the government nominees had proposed a special refinance window for NBFCs but the regulator had declined the request. It said there wasn’t a strong enough case for a special finance window because only about 200 out of over 11,000 NBFCs in the country were deposit-taking. The regulator doesn’t want to do an across-the-board intervention for now, sources said. The FSDC meeting took place against the backdrop of a scathing address by Acharya on Friday, when he made a strong case for granting more independence to the central bank and said the governments that did not respect their central bank's independence would invite the wrath of the financial markets. Given that context, the FSDC meeting started with an air of tension in the room. An official present in the meeting described the participants’ body language as “tetchy”. However, once presentations and discussions begun, the mood considerably eased. “The discussions, primarily on liquidity issues in NBFCs, were technical and academic, and hence there wasn’t much time for the participants to espouse personal opinions on other matters,” an official said, when asked if any point of difference between the RBI and government cropped up during the meeting. After the meeting, no government official commented on anything even as Patel and his colleagues left North Block though a different exit point.